Towards a green economy in the Mediterranean. 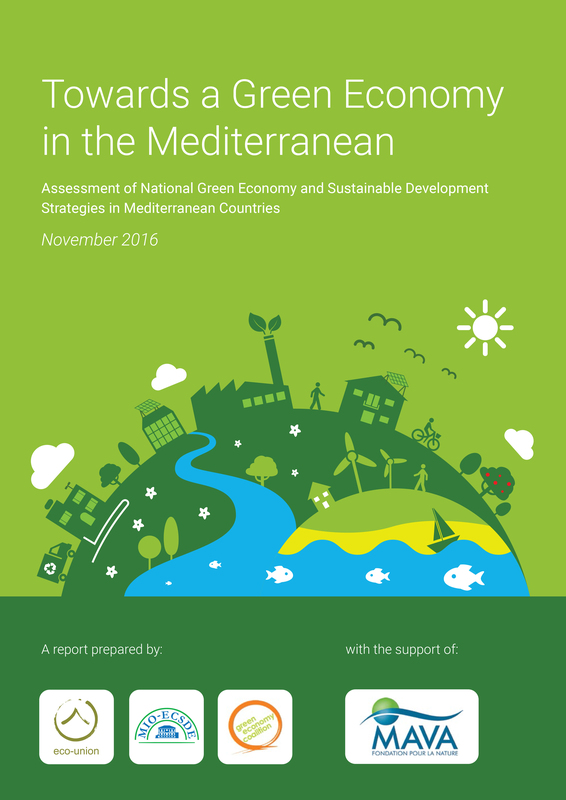 Assessment of National Green Economy and Sustainable Development Strategies in Mediterranean Countries. Fosse J, Roniotes A, Greenfield O, Gros P. eco-union, MIO-ECSDE, GEC, 2016. An initiative of dedicated civil society organizations (eco-union, MIO-ECSDE and the GEC) aiming solely to boost the transition towards a green and fair economy in the Mediterranean, the study presents the results of a review exercise covering Green Economy (GE) strategies and Sustainable Development (SD) policies in 20 Mediterranean countries. Existing strategies that are publicly available and accessible and the opinions and perceptions of key Green Economy and Sustainability practitioners were the basis of the assessment. In a nutshell, the main outcome of the study is that the large majority of Mediterranean countries have out-dated or incomplete national GE/SD strategies. Often they are vague, not giving clear definitions or indicators. Only five countries (France, Italy, Morocco, Portugal and Tunisia) can claim to have good, up-to-date and detailed strategies with clear indicators, or – in the case of Italy – supporting legislation in place. Seven countries (Albania, Bosnia-Herzegovina, Cyprus, Egypt, Slovenia and Spain) have outdated GE/SD strategies or none at all. The rest of the Mediterranean countries (Algeria, Croatia, Greece, Israel, Jordan, Lebanon, Malta, Montenegro, Palestine and Turkey) are somewhere in between these two groups of countries. To reach these results an extensive literature review was conducted over a three-month period followed by a methodological assessment of the findings which was complemented by an on-line survey addressed to key regional and national GE/SD actors that brought in useful insights on what is happening on the ground in the countries. Based on these findings and the valuable inputs of an expert workshop that took place in Morocco (Tangier, 20 July 2016) this document proposes a number of concrete recommendations that aim to accelerate the much needed transition towards a Green Economy in the Mediterranean region.